Tomatoes, though actually a fruit, are commonly considered and prepared as a vegetable since they don't posses the sweet taste of most fruits. Instead, they have a subtle sweetness along with a slightly bitter and acidic taste. Tomatoes are an excellent source of vitamins c, a and k and the phytonutrient lycopene. Lycopene, a carotenoid found in tomatoes (and everything made from them) has been extensively studied for its antioxidant and cancer-preventing properties. The antioxidant function of lycopene and its abilty to help protect cells and other structures in the body from oxygen damage has been linked in human research to the protection of DNA inside of white blood cells. In addition, lycopene' antioxidant quality has been shown to contribute to the prevention of heart disease. The lycopene in tomatoes has been know to be helpful in reducing the risk of prostate cancer, pancreatic cancer, colorectal cancer, breast cancer, lung cancer, endometrial cancer and heart disease. Tomatoes have also been credited with improving cholesterol profiles, reducing blood-clotting tendencies, as a natural anti-inflammatory, maintaing good bone health, reducing stress and helping against colon cancer, diabetes and migraines. And if that isn't enough good news regarding tomatoes, when eaten along with broccoli additional cancer-fighting effects have been recognized. In fact, this combination of vegetables eaten together have been shown to greatly outperform other diets in lab testing. When choosing tomatoes and tomato products choose organic. Organic ketchup delivers three times as much of the cancer-fighting carotenoid, lycopene, as non-organic brands. Lycopene has been shown to protect not only against prostate, but breast, pancreatic and intestinal cancers especially when consumed with fat-rich foods like avocado, olive oil or nuts. This is because carotenoids are fat-soluble so they are absorbe into the body along with fats. Holy guacamole! - Make sure they are a deep rich color. 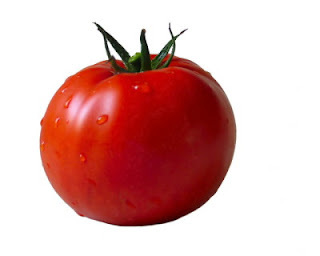 This is not only a sign of a delicious tasting tomato, but deep color also indicates a greater supply of of the health-promoting phytonutrient red pigment, lycopene. - Tomatoes should be well shaped and smooth skinned with no wrinkles, cracks, bruises or soft spots. - Choose canned tomatoes produced in the United States as many foriegn countries do not have as strict standard for lead content in containers. This is important with tomatoes due to their acidic nature and abilty to cause corrosion. - Store tomatoes at room temperature as they are sensitive to cold and it will impede their ripening process. As usual, for the most health benefits, use whole tomatoes whenever possible. Some tomatoes products such as tomato paste is processed without the skin, a significant source of those great carotenoids. So what do you think about some whole wheat pasta smothered in tomato sauce with a side of broccoli for dinner? Sounds good to me! Source: For a more in depth look at the health benefits of tomatoes visit The World's Healthiest Foods. I love tomatoes too, we had a small tomato plant in our home garden when I was young, and me and my sister used to wait and see tomatoes go red from green, and then eat them. It used to be so much fun. If I could only buy one organic fruit or vegetable, it would be tomatoes! For the simple reason that commercially grown tomatoes taste like nothing and just seem to nutrient-poor. If I had space I would grow my own. I love the plum and cherry tomatoes the best!